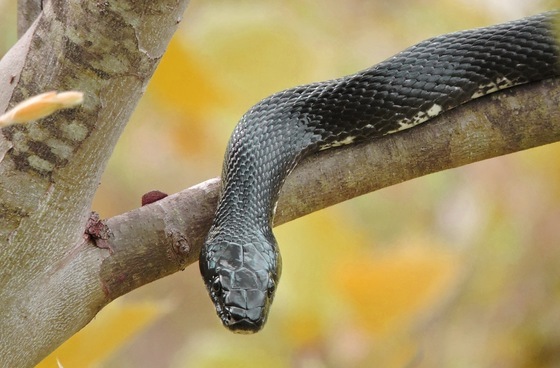 As fall temperatures sink, snakes seek warmer places to weather the coming winter. Usually those shelters are underground. But occasionally snakes turn up in a crawlspace, garage or – rarely – a house. Before someone starts mentally replaying “Snakes on a Plane,” DNR senior wildlife biologist John Jensen explains that if a Georgia snake makes it inside, it’s almost always a rat snake, a non-venomous species. Rat snakes are good climbers and can find openings such as unscreened roof or foundation vents. He also notes that warmth is only one of three reasons snakes are found around houses. The other two are prey and safe places to shed (eye cap scales loosen with the older skin, temporarily blinding the snake). Homeowners who don’t want snakes nearby at any time of the year should keep areas close to the house free of brush and debris, both of which can attract prey animals and provide refuge for reptiles. However, Jensen stressed that snakes fill natural roles that benefit people. Rat snakes hunt rodents. Kingsnakes eat other snakes, including venomous ones. Some species prey on garden pests: to name a few, brown and red-bellied snakes favor snails and slugs, and southeastern crowned snakes eat centipedes. Snakes in a house? That’s rare. Snakes around the house: That’s a different story. If a snake is in a garage, shed or crawlspace, allow or encourage it to leave, then find and close access points. If in the house, call a nuisance wildlife trapper. Killing Georgia’s non-venomous snakes is illegal. More on dealing with nuisance wildlife. Of the more than 1,500 rare species tracked by Georgia DNR, only a small portion are on publicly owned land. When a rare species is found on a highway right of way or in a state park, DNR can team with other agencies to develop a management plan to better conserve that species. 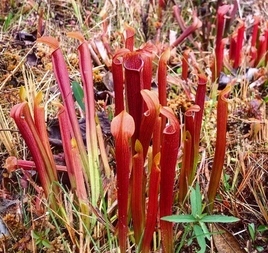 But what happens when a rare plant is discovered on private land? It depends on the landowner. Wind Chapman owns Long Mountain Living History Center near Dahlonega. He also lives and works as a blacksmith there. 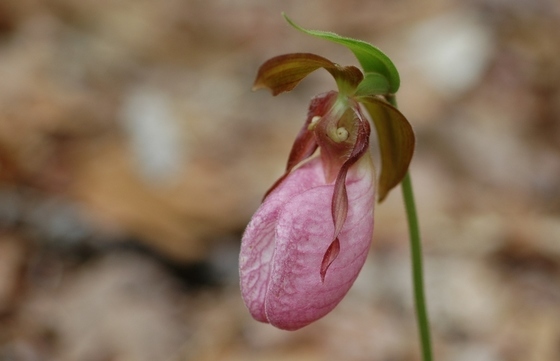 But while his workshop is filled with restored colonial artifacts, the woods surrounding the center hold a living treasure: dozens of pink ladyslippers. 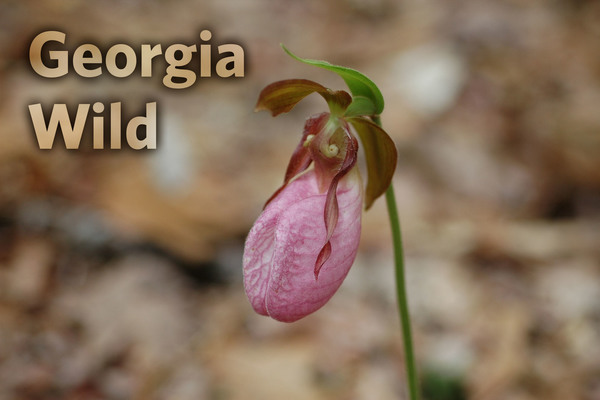 Though not endangered, Cypripedium acaule is state-listed in Georgia as unusual, primarily because this orchid easily recognized by its bright pink blooms is threatened by poaching. When Chapman discovered the orchids on land he planned to convert to pasture, he contacted DNR Wildlife Conservation Section botanist Tom Patrick to plan a rescue mission. In October, technicians Melanie Flood, Morgan Bettcher and Katie O’Shields joined Patrick at Chapman’s property for the emergency relocation. Thirty-six pink ladyslippers were recovered. The orchids will be moved to nearby Smithgall Woods State Park for safekeeping, where they will live to bloom another spring. "This way they will be enjoyed by visitors to Smithgall Woods," Chapman said. The work at Long Mountain Living History Center is just one example of landowners collaborating with DNR to protect Georgia’s vulnerable wildlife. Anyone interested in preserving a rare plant or animal species on their property is encouraged to contact the Wildlife Conservation Section at (706) 557-3213 for help and recommendations. Katie O’Shields is a database technician in the Wildlife Conservation Section. Local landowner Stuart Bowen and his son Vance recently helped DNR botanist Dr. J. Mincy Moffett Jr. and technician Marylou Moore survey powerline rights of way in Emanuel and Candler counties for sweet pitcherplant and purpledisk (or purple) honeycomb-head. Both are listed as high priorities for conservation in Georgia’s State Wildlife Action Plan. Two sites for sweet pitcherplant (right) were relocated and two new sites were found for honeycomb-head. The species of the honeycomb-head, whether it was purpledisk or oneflower, could not be immediately determined. Georgia Plant Conservation Alliance members will grow seeds collected from the plants to boost a local plant safeguarding project under powerlines at Ohoopee Dunes Wildlife Management Area. DNR coordinates long-term monitoring of Georgia aster in Georgia. 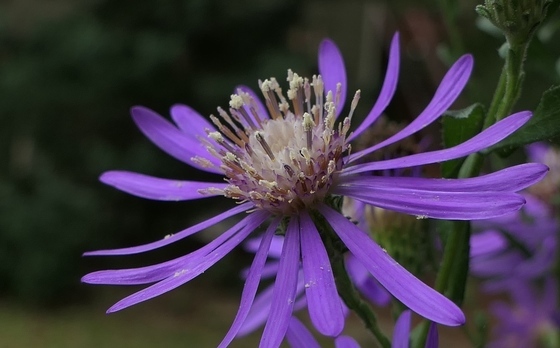 The work is part of a Candidate Conservation Agreement aimed at recovering this rare wildflower so that it does not need listing under the Endangered Species Act. There are six monitoring plots total, with 24 sampling stations each, scattered across Lower Broad River, Oaky Woods and Wilson Shoals wildlife management areas and Chattahoochee Bend, Pickett’s Mill and Red Top Mountain state parks. Preliminary observations from checks this fall indicate quality populations responding well to management at Lower Broad River, Pickett’s Mill, Oaky Woods and Chattahoochee Bend, while the populations at Red Top Mountain and Wilson Shoals remain small. A bonus this year was finding New England aster, a plant critically imperiled in Georgia, at Oaky Woods WMA. Most homeowners who feed birds consider gray squirrels their nemesis. The squirrels eat more than their share of bird food and then add insult to injury by gnawing on feeders. The war on squirrels is constantly fought on many fronts throughout our state. 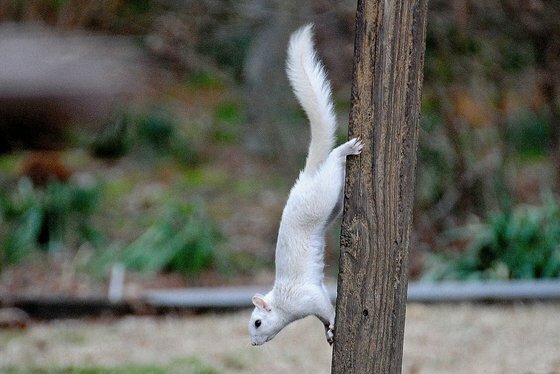 But if you feed birds, how would you feel if a white squirrel showed up at your feeder? Would you treat it with the same disdain you do a normal-colored gray squirrel? Read the rest of Terry’s column to learn how grays become white. Nearly 83 percent of voters supported the Georgia Outdoor Stewardship Amendment, approving the Nov. 6 measure by more than 3.1 million votes to just under 651,500. Amendment 1 authorizes the state to dedicate for land conservation up to 80 percent of existing sales taxes on outdoor sporting goods. Passage will provide an estimated $20 million a year to acquire, protect and improve lands critical for clean water, native wildlife and public recreation. 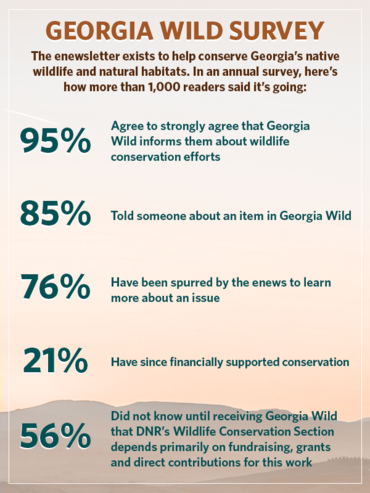 Thanks to all who took part in the annual Georgia Wild survey. All feedback, parts of which are shown at right, will help make the enewsletter more interesting and effective. And 10 respondents, ranging from Toccoa to Woodbury and Atlanta to St. Marys, are now sporting a new DNR hat ("Offer an opinion, win a cap," Sept. 25). A DNR fish survey crew using backpack electrofishers and bait traps at the confluence of the Little Ocmulgee River and Alligator Creek on Alligator Creek Wildlife Management Area documented 19 species, including pirate perch, speckled madtom, a pygmy sunfish species and three darter species. A boat electrofishing survey on the Little Ocmulgee just upstream from the Ocmulgee River netted 28 species varying from notchlip redhorse to spotted suckers and several bass, sunfish and catfish species. The Georgia Plant Conservation Alliance’s 12th annual symposium drew 49 people from 26 organizations and four other states: Alabama, Florida, South Carolina and Pennsylvania. 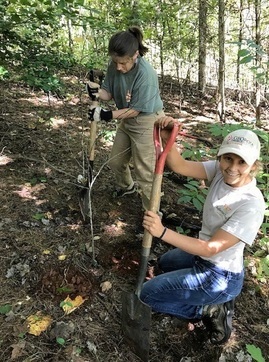 In addition to presentations on rare plants, habitat conservation and pollinator studies at base camp – George L. Smith State Park – the group explored Ohoopee Dunes Wildlife Management Area and Canoochee Bogs and took part in a moth survey. Young birdwatchers will search for all available bird species during the Dec. 8 Youth Christmas Bird count at Charlie Elliott Wildlife Center, about an hour southeast of Atlanta. The two-and-half-hour event is designed for birding newcomers ages 8-16, and includes guides, binoculars and lunch. A pygmy killer whale stranded on Sea Island Nov. 3, only the fourth record of this oceanic delphinid species documented in Georgia waters and the first since 2004. A post-mortem examination found that the more than 6-foot-long whale likely stranded from natural causes. Report marine mammal strandings to DNR at (800) 2-SAVE-ME (800-272-8363). Eastern screech owls not only bring live blind snakes to their nestlings, some of those snakes survive and end up living in the nests. A study in the journal Oecologia also suggests that the live-in snakes boost nestling growth and survival rates by eating insect larvae that pose risks as parasites and competition for food. Quick takes: Read this DNR blog post to learn what chronic wasting disease is and why Georgia – and the rest of the nation – is concerned about it. 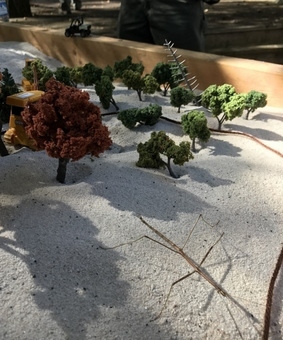 A stick insect (left) inserted itself into a decision-making exercise on the sand table during recent DNR prescribed fire training. DNR Cpl. Ben Cunningham helped free a buck tangled in a rope swing last week in Floyd County. Waterfowl season in Georgia opens this weekend and runs until Nov. 25, then Dec. 8-Jan. 27. Wildlife Conservation Section staff in Brunswick are monitoring monarchs, gulf fritillaries and cloudless sulphurs weekly in a Butterflies of the Atlantic Flyway Alliance project probing butterfly migration. The Houston Astros’ new minor league baseball team in Fayetteville, N.C. – the Fayetteville Woodpeckers – has adopted the red-cockaded woodpecker as its mascot. North Carolina's mosses, liverworts and hornworts are profiled online at Bryophytes of North Carolina, thanks to the North Carolina Biodiversity Project. Names in the news: The National Wild Turkey Federation’s Georgia chapter named DNR Cpl. Derrell Worth its Officer of the Year. Noted for his aggressive but fair pursuit of violators, the 20-year DNR employee was even accidentally shot while on patrol (the shooter plead guilty to three counts, including hunting over a baited area). DNR’s Scott Robinson, regional operations manager for the Fisheries Management Section, is a member and one of the original organizers of the Georgia Aquatic Connectivity Team. The group, which recently held its annual meeting, is working to remove or replace dams and culverts for the benefit of fish populations and aquatic ecosystems. Berry College’s Dr. Renee Carleton received the 2018 Distinguished Service Award from the University of Florida’s College of Veterinary Medicine. Carleton, whose research focuses on diseases in birds and who also monitors Berry’s bald eagle nests, was honored by her alma mater for her achievements and service in and out of the classroom. Dec. 11 – Feral swine workshop and trapping demo, 9 a.m.-1 p.m., Pierce County Ag Services Building, Blackshear. Other workshops: Dec. 18 (Dawsonville), Jan. 7 (Quitman), Jan. 29 (Hawkinsville). A yellow-bellied slider in hand, Maisie MacKnight of DNR talks turtles with Adventures in Science Day visitors at the Fernbank Museum of Natural History. 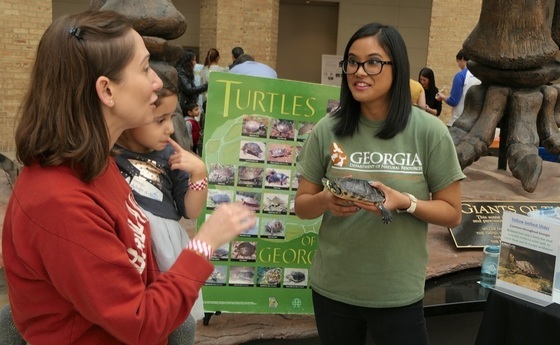 McKnight joined Environmental Outreach Coordinator Linda May and fellow staff Carmen Candal, Katie O'Shields and Sabrina Sewell for the Nov. 3 event at the Atlanta museum. The group discussed pitcherplant adaptations, aquatic and terrestrial turtles, and barred owls – even using a live owl to help explain how these birds of prey fly and hunt at night.